Have you heard of the LG G2 smartphone? I’ll admit, I didn’t expect much when I had agreed to review it. I hadn’t heard much about its features, and honestly, how different can smartphones be these days? I’ve quickly come to the conclusion that I was wrong to dismiss it so easily, and am now entirely smitten with this sweet little phone! I surprised both TheHubs and myself when I made the decision to make this android Jelly Bean (4.2.2) smartphone my main go-to tech for my communication needs, especially since I had bought my then-current phone just over a year ago. The LG G2 simply outshines it. That’s not to say its not without any quirks, but for the moment, this is the phone you’ll see me with. 2.26GHz Quad core CPU – For instance, it doesn’t take very much to turn on/off or restart this phone. Have you ever had to stand there, holding your phone’s power button for like… ten seconds, before it realises you want it to wake up? That doesn’t happen with the LG G2. I’m actually still not used to the phone turning on immediately, which may sound weird, but I’ve had it for a few weeks now and the speed still surprises me. As fabulous as this phone is, it’s not without a learning curve. Screen capturing is done by holding both the power button and the down volume button at the same time. It’s not the easiest task as the buttons are essentially connected, and not readily accessible by trying to push both buttons at once with two fingers. However, once you figure out that sweet spot and have committed it to muscle memory, it becomes easier to handle. How to create a screen capture. Hopefully these tips and tricks will help you master your LG G2! If you have any questions about the phone, or have your own tips to share, I would love to hear them in the comments below! Also? If you’re a TELUS customer, why not take advantage of their free one-on-one TELUS Learning Centre sessions to personally see everything the LG G2 can do, and how to use it easily. Some great tips here. SmartPhones have come a long way since they were first introduced. I second the buying of the protective cover for the screen for ANY phone!! Loving the sound of that guest feature. You know, I have never even really thought of LG as an option but I am completely intrigued. P.S. That stylus pen app is COOL. That Quick Memo app is like having access to an unlimited supply of sticky notes, lol. Love it! 🙂 And yeah, I’m entirely impressed and truly surprised with how effective the G2 is. Its definitely now one that I’m highly recommending to test out when shopping for a new phone. Oh My Gosh! I am LOVING the Avengers background! That is super cool! What a great post! Phones are so cool these days! First off I want to say I love that Avengers background. Where did you get it? I will soon be in the market for a new smartphone and from what I have been reading I think the LG 2G will be on my list of phones to check out. Yes, if you can get your hands on a working LG G2 while researching your next phone check it out (I never could understand why in-store demo models would always be shut off, so you’d have to guess if you like its features – I think Rogers stores do let you play with powered on models though.) The LG G2 is truly handy, and quick. I love Android, so much you can do. Never heard about this phone until this post, will definitely check it out. My Note came with a pen which I loved for the reasons you listed, but this phone is smaller and way nicer to handle. I’m an Apple chick but love that this phone has all of these features. When I need to upgrade I think this will be the phone to get. Nice review! It looks like a really great product! I have tried others but always go back to my iPhone. The resolution of that screen is out of this world. Definitely an awesome new gadget!! Let me tell you, I would love that guest feature to keep the kids out of my stuff! The stylus pen would be awesome! Guest mode – now that is GENIUS! Why can’t all phones have that? Thanks for this thorough tutorial! I have read LG G2 Smartphone detailed review on reputed tech blogs but didn’t find tricks like folder organizing, it have sensitive screen, Stylish pen etc. Really awesome tips for LG G2 users to have more exposure on how smartly they can use this newest Smartphone in market. Thank you for this post! I just received the same phone to review today & haven’t found my way around it quite yet. Love the guest mode- I’m looking forward to putting that to work with my 4 year old! I like that double tap feature but it would just be nice to have the option to turn it on/off in settings or something so that it doesn’t turn on in a purse or something. Hey Liz! While I haven’t found (yet) a way to turn off the double-tap, its become a feature I can’t live without, lol! That said, though I haven’t seen any sign of it randomly turning itself on while in my purse, if you also have the lock screen on – your phone can’t be accessed until you put in the unlock password. So if it accidentally double-taps open, it will still only wind up on the lock screen. Wow, that looks like a great phone! I love the customized background (I miss that on my phone) and the guest mode would be awesome for kids to play with. I love the guest mode! I also like that it has a long battery life. My cell phone battery seems to go so fast. Really great tips for the LG gs smartphone. I have the phone and it’s very helpful tips for me. Will come again to read more new. Thanks. I’ve recently switched from an iPhone to the lgg2. So far i like it but one of the things ive noticed is you cant post a pic in the comments section on facebook. I was able to do it on my iphone. Facebook has a ton of variations of their website depending on what app, OS or even browser window you happen to be using. There are cool things for comments that my FB friends have (like direct replies to commenters) that I don’t have and am not sure when that feature will finally be available for my account. (FB has this way of making me want to pull my hair out, LOL!) That all said, you’re right, there currently isn’t a way to post pictures in comments at least in the LG G2 Android phone, though that might be the case for all Android phones; not sure. Hopefully FB is working on fixing that though! :/ My smartphone app for FB keeps changing all the time, so it might just be a matter of when that option will roll out. I don’t know about the battery life though. Mine drains in just a matter of hours. I have to constantly charge it every 6 hours or so. Any tips on how to prolong the battery life? Since I haven’t had that issue myself, I can only guess, but here are a couple things to look for to prolong battery life on any smartphone. #1 – has this issue happened always, since out of box? If so, there might be a manufacturing issue with your battery, and could need a replacement. Talk to your service provider about warranty/replacement, etc. #2 – if its a more recent issue: There are some apps that simply run hot and drain a battery quickly, so look into what you’ve just recently downloaded to find what might be the culprit. If your camera is virtually on all day long, or if Netflix/Hulu/YouTube or any other audio/video app is running constantly, these can drain your battery quicker. Likewise, if the screen brightness is always kept to 100%, that would increase rapid consumption. 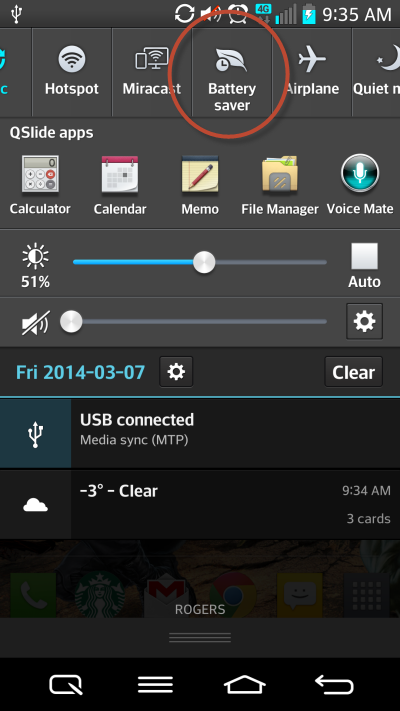 The LG G2 has a battery saver option in the drop down settings file as shown in the image below. I’ve just pressed the button to see what it would give me, and if I hit the okay button to agree to its suggestions, it’ll turn off “Wifi, Bluetooth, Vibrate on Touch, Brightness, and Screen timeout.” So perhaps see if it has any suggestions to help your phone at all. How did you change the guest mode wallpaper? I’m shocked to say that there isn’t yet a way to change the guest mode wallpaper “out of box.” I did find an apk developed to create the ability to change the guest mode background, but if you’re not familiar with 3rd party android installations, I really wouldn’t suggest trying this alternative out. I haven’t tried it myself, so I can’t comment on how well this apk works. I’m going to keep an eye on this topic though and see if there are any changes with future updates by LG or possible Android apps. Its really weird that this type of ability isn’t available yet! Have you heard or found out anything about the screen sensitivity issues? I have the LG G2 (D802) .. but i have a problem in the glass on the camera lens ..
they say, “This camera has been protected by Sapphire Crystal Glass” but my camera has not been one week already suffered scratches .. did you ever experience ? I have this phone and using it almost a month. I have not experience a problem so far. The battery is amazing that can long last in a day even my wifi is turned on. Thanks for the tips about quick memo. Btw where did you get ur stylus pen? I just got this phone today, I absolutely love it so far!! I do have one question I’ve been searching for an answer to, I will try to describe as best I can. When ever you’re moving apps around or adding shortcuts of apps, there’s a feature where you can tilt your phone to one side or the other and it rotates between screens and you can place an app. Do you (or anyone else reading) know how to turn this feature off?? I have looked all up and down the settings and cannot find it for the life of me. I know it can be turned off because I remember turning it on! I’m sure it’s right in front of me, but I’m at a loss. Have an Iphone. But I’m always curious to see what technologies are on others. Thank you! Some excellent info here, thank you very much! 🙂 I’ve had my G2 for a while now and it never let me down. The sheer performance power makes this the quickest and most responsive phone I have ever had, and also the battery life is phenomenal for such a high powered device. Could you please suggest some stylus for this phone.